I am still practising to use the big Nikon camera and I recently took the shot of the golf carts parking behind Fusion, the supermarkt at the Discovery Bay Plaza. Does it not look fun to see these carts lined up like this? The golf carts are the only way of private transport in Discovery Bay. If you don’t own or rent one, you can only take the public bus or walk. For some of the properties that are a little further away from the pier it makes sense to get a golf cart to travel around, but be aware, these things are very pricey. You can buy more than one car for its price! If you own property in Discovery Bay, you are allowed to buy a golf cart. 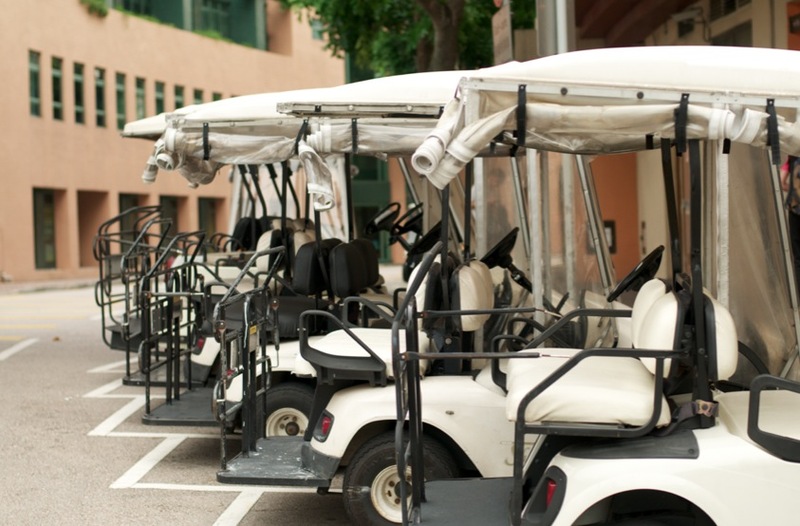 However, there are only around 500 golf carts allowed in Discovery Bay by the government. The price of a golf cart together with the license can be anything up to 2,000,000 HKD (no typing mistake, I mean 2 million HKD). However, it is cheaper if you rent it. The prices can be between 6,500 HKD and 8,000 HKD a month. 100,000 HKD per year are not uncommon prices. However, there are flats that have golf carts included so that might be a cheaper option.